Labor Day is considered by most people to be summer's last hurrah before heading back to school, work, or even just their normal daily routines. As the second-largest state, Texas is known for doing everything big. If you happen to be spending the final three-day weekend of the unofficial end of summer in central Texas, you might want to celebrate Lonestar State-style. Consider checking out the giant Czech fest in West, Texas, or head on over to Hill Country for the world championship goat cook-off or go for a three-story plunge on the Master Blaster ride in New Braunfels. Every year West, Texas, located just north of Waco, hosts Westfest, which is one of the largest Czech Polka fests in the state. The event features polka bands and cultural food and drink, dancing, Miss Westfest contest, a parade, baking contests, fun run, horseshoe contest, eating contests, arts and crafts, and more. For children, there are carnival rides, a gymnastics exhibition, and, if you want to get a birds-eye view of the fairgrounds and surrounding area, you can go for a helicopter ride. For more than four decades, teams descend on the tiny Hill Country town of Brady for the World Championship BBQ Goat Cook-off on Labor Day weekend. The giant cook-off boasts 206 cook teams with more than a 90-plus team waiting list. Close to 10,000 attendees come from all over Texas and beyond. More than 5,700 pounds of goat is cooked each year in Richard’s Park. During the weekend there's also Texas beer and wine tasting, arts and crafts fair, children’s activities, a Goat Gallop fun run, a horseshoe tournament, and live music. 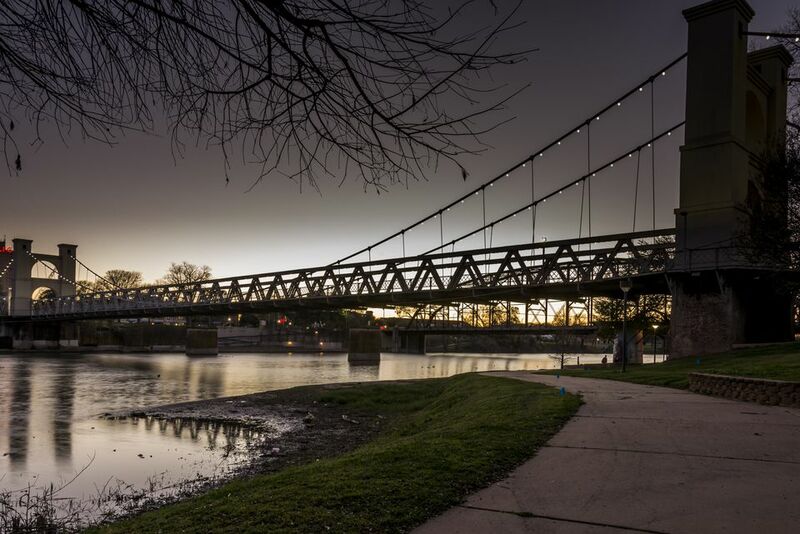 With its rich history, scenic beauty, and humid subtropical climate, Fredericksburg attracts visitors throughout the year. During the Labor Day weekend, check out the 1940s USO-Style Labor Day dance at the Hangar Hotel. A portion of the proceeds ​will benefit the Fort Hood USO. Costumes are welcome, and a costume contest from the WWII-era period offers a variety of prizes for winners. There's plenty to see and do in Fredericksburg, like planning a visit the National Museum of the Pacific War, try the delicious varieties of pecans at the Fredericksburg Pecan Company, or pick some peaches at the Vogel Orchard. Northeast of San Antonio is New Braunfels, Texas, which is known for its rivers and water park. Runners, kids, and water-park enthusiasts make New Braunfels a key Texas destination for Labor Day weekend. The city hosts the annual SARR Labor Day Whine Run 5K/5-miler. The fun event has become a local tradition, and it welcomes runners of all abilities. While in New Braunfels, it’s impossible to resist a visit to the ​Schlitterbahn Water Park. The park attracts visitors from all over the country to stay at one of its seven unique resort experiences. Also, you can ride the award-winning Master Blaster ride, which has a three-story plunge. ​If you go to Schlitterbahn, get a Blast Pass to avoid standing in long lines for the rides. Held at the Westin Galleria Houston, the BIG Salsa Festival takes place over four days in the salsa dancing capital of the south. There will be amazing dancers and delicious food. BIG Salsa Festival features dance classes, performances, band concerts, and latin dance parties. In Belton, Texas, part of the Killeen-Temple metropolitan area, the Central Texas State Fair runs through September 1, 2019. There are live concerts, pro bull riding at the rodeo, carnival rides, vendor shopping, and all the fair events such as livestock judging and good old fair food. The Colorado River 100 canoeing race begins in Fisherman's Park in Bastrop, Texas, about 30 miles southeast of Austin, and ends 62 miles away in LaGrange. The Colorado River 100, held on Friday and Saturday, attracts paddlers and adventure racers from across the country. Also, the event raises environmental awareness of the water and lands of the lower Colorado River.